Most modern smartphones are usually pretty durable, but they won’t last forever. Just like a car, they can start to break down, especially after years of heavy use. Things like battery life, screens, charging ports and memory all start to degrade over time and eventually, most people will have to get new phones. Considering how expensive some smartphones are, having to replace them prematurely can really break the bank. However, it doesn’t have to be this way. The way we treat our phones can have really positive (or negative) effects on their longevity. It may require the purchase of an accessory here and there, but that’s still a lot better than having to purchase a new phone all together. Whether it’s a hard case than can withstand drops from high altitudes, a special charger, or a screen protector, there are a variety of options available that can help keep your valuable smartphone safe and long-lasting. One component that sees an incredible amount of use is the charging port. We practically use the charging port every single night when we charge our phones, and over time the pins can get damaged or corroded, rendering the phone unable to hold a charge. This means you can either get it replaced, or you can get yourself an entirely new phone—neither of which are great options. Luckily, there’s a solution. Charging smartphones doesn’t always have to involve a wire that plugs into the charging port and has to get ejected every single night. There are a number of charging options available for phones that have wireless charging components built-in. By using small magnetic coils, these wireless chargers can transfer power to your phone without the use of a lightening or Micro USB cable. Many of them also double as convenient stands, so you can keep using your phone on your desk, even as it charges. We had a chance to take a look at one of these newly-released chargers to see if it really was a solution to wired charging. 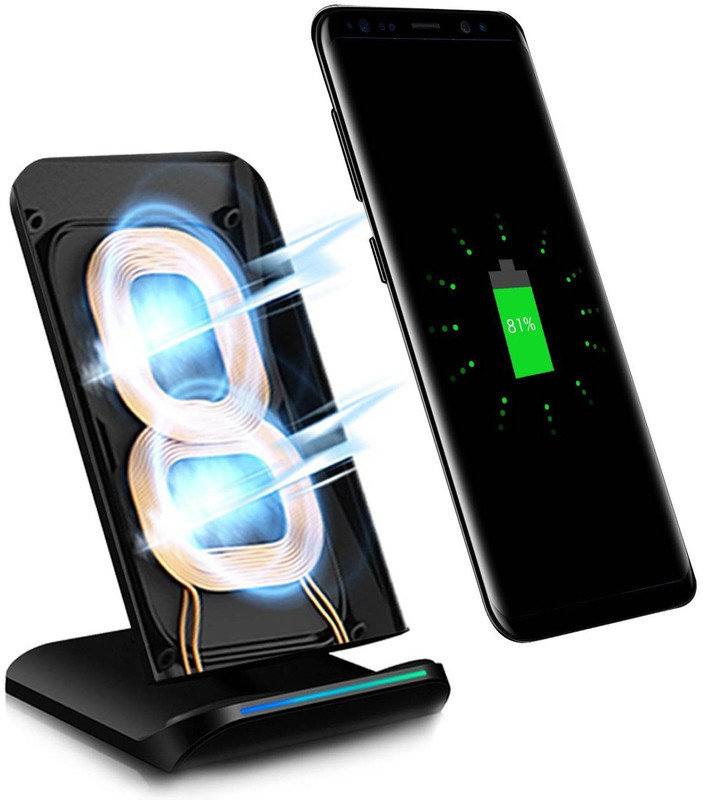 It’s called the Pleson Fast Wireless Charger and it’s compatible with a number of different phones. We’ll be looking at the ins and outs of this charger for a fully comprehensive breakdown of just how useful it really is. 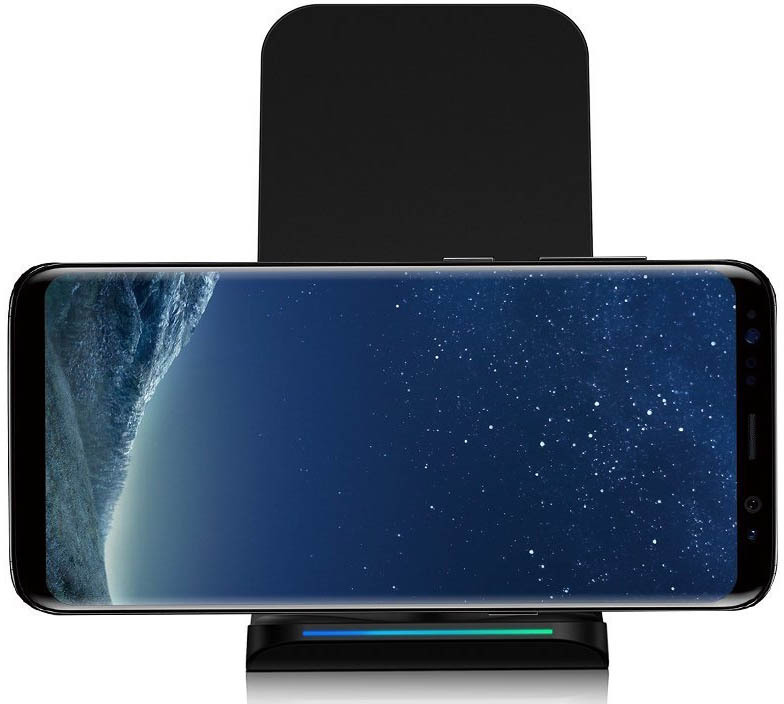 The Pleson Fast Wireless Charger has a really sleek, simple and stylish design that made it look like it could have a place on just about any desk or countertop. It only comes in black, but we felt that this choice matched with the simple design, and didn’t find ourselves wanting much else when it came to color. It’s about the same size as a smartphone, measuring in at 0.4 x 4.7 x 2.9 inches. In addition, it weighs only seven ounces. 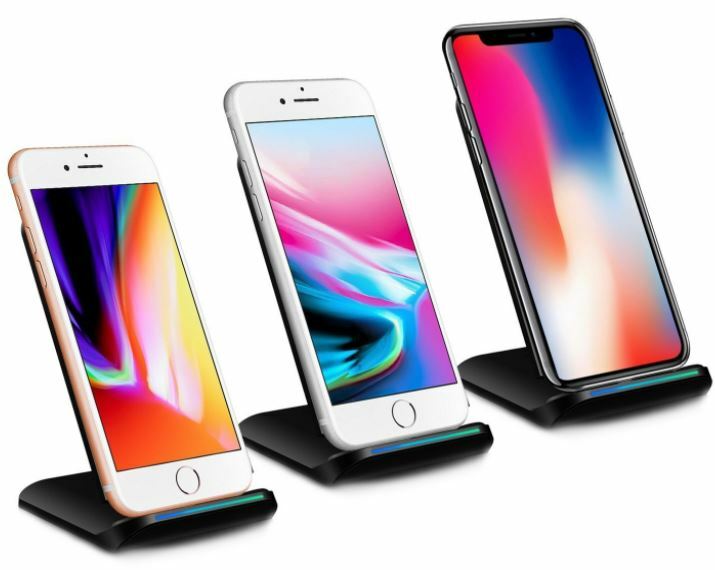 On the front you’ll find a small shelf for your smartphone to sit while charging, as well as a support that acts as a stand with the Pleson logo printed on it. You’ll also see the words “Fast Charge” underneath the logo. On the back of the charger you’ll find the USB port used to power the unit. You can use the included USB cable, but you’ll have to provide your own power adapter for the charger to work. The bottom of the charger is covered in an anti-slip mat to prevent it from moving around on a desk or countertop. It may not be obvious by looking at the exterior, but the Pleson Charger has dual charging coils built-in. The reason this is so useful is because it allows for you to charge your phone either horizontally or vertically. You can continue to watch videos or take calls due to this nifty addition to the design. We really liked the layout, mainly because it was simple, felt sturdy and also seemed to give it a lot of versatility. The Pleson Wireless Charger has some really impressive charge times. It’ll give you the ability to charge compatible smartphones in less than 2.5 hours. This is about 1.4 times faster than using a wired charger and when we tried it out, it certainly passed the test. There was a noticeable increase in charging speed from using a wired charger, which was somewhat of a surprise considering wired chargers are usually a little quicker. Due to the dual-coils, finding the “sweet-spot” for charging was pretty easy. 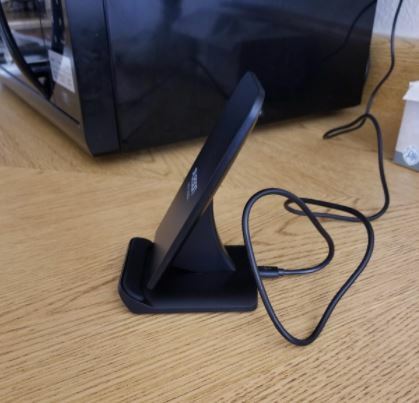 On other wireless chargers, the magnetic coils don’t always line up with the smartphone’s coils, making it hard to start the charging process. 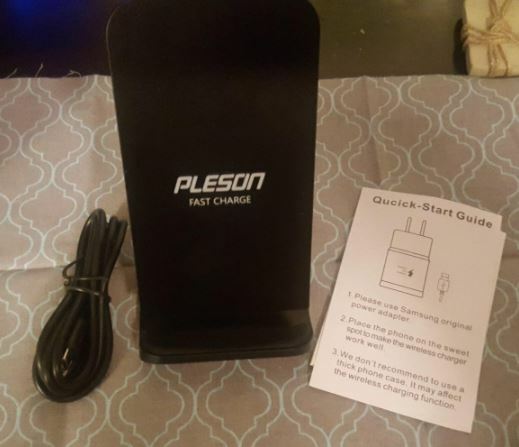 With the Pleson Charger there was an instant connection, regardless of whether or not we mounted the phone horizontally or vertically. In addition, there’s built-in over-voltage, under-voltage, temperature-control, surge protection and short-circuit protection. This means you can leave your smartphone on it for long-periods of time even after it’s reached a full charge. We did notice that it occasionally created a little heat during charging, but it wasn’t enough that either the phone or charger was very hot to the touch. It’s worth noting that the type of adapter you use as well as the kind of phone you wish to charge will have an effect on your charge times. For example, some smartphone models will not be able to take advantage of the faster charge times, and you’ll also need at least a Q.C. 2.0 adapter for those that are compatible with fast charging. If you aren’t sure if your smartphone is compatible, the charger will actually let you know. The indicator light on the bottom of the charger will turn green if your phone is compatible, but will turn blue if it isn’t. It doesn’t seem like the most clear way to indicate the compatibility of a phone, but it did work very well once we understood what each color meant. 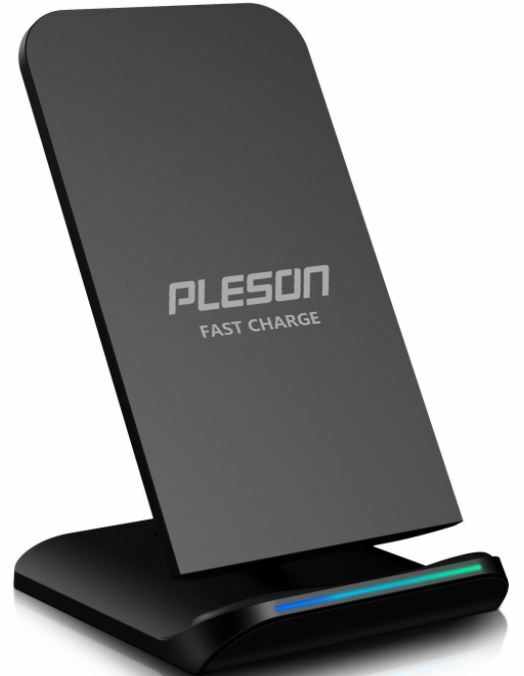 The Pleson Fast Wireless Charger is compatible with both Apple and Android devices, but only those that have wireless charging coils. For Apple products, this includes, the iPhone X, iPhone 8 as well as the iPhone 8 Plus. 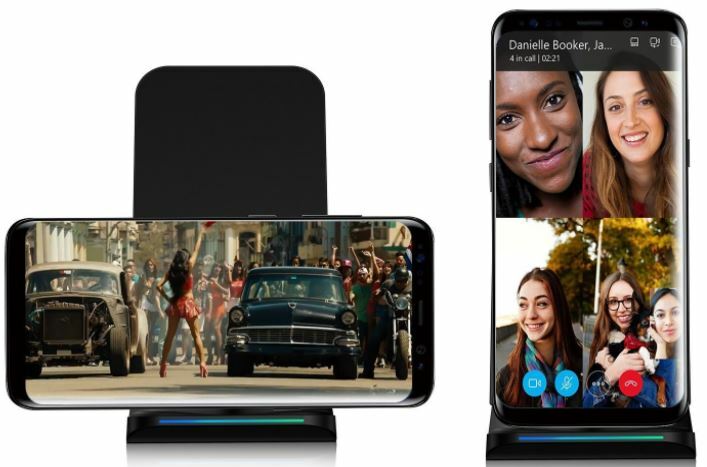 Compatible Android devices included the Galaxy S8, Note 8, S7, Galaxy S6 edge +, S7 edge as well as the S8+. The main difference is that the Samsung phones can take advantage of the charger’s fast charging capabilities, while Apple phones can’t. To be honest, this was a little disappointing, and was definitely limiting for Apple users, but is more a fault of the iPhone’s design, rather than the charger itself. Still, it would have been nice for it to be able to charge both types of smartphones with equal speeds. The charger can also charge through a number of different smartphone cases. You’ll be able to charge through rubber, hybrid material, or plastic. However, if there’s any metal in your phone’s case, it could throw off the magnetic coils and the charger may have trouble. The Pleson Fast Wireless Charger is certainly a well-made charging solution, but it does come with a few minor downsides. First and foremost, it can’t be used around anything metal. It’s understandable, since the technology that allows it to charge smartphones does rely on a magnetic coil. However, this was still fairly inconvenient since it may not always be obvious if there’s a metal or magnetic object in the vicinity. In the presence of metal, the charger will read that the current smartphone is incompatible. This, at first, led us to believe it might be broken. It’s easily remedied by moving it away from metal, but for someone who may not be aware of how it works, we could see this being confusing. Also, we would have liked for it to come with a power adapter. It does come with an included Micro-USB cable, but in order to use it you’ll have to hang on to the power adapter that came with your phone or use another one. It didn’t impede the performance, it just would have been a little bit more convenient for it to be ready to use directly out of the box. Additionally, different adapters can affect the speed of the charger. If Pleson had included one that was universally fast, this would have made the charger even more of a home run. Lastly, while it was compatible with a ton of different smartphones, it doesn’t quite charge Apple phones as quickly as Samsung models. It’s still capable of charging both types wirelessly, but there was a noticeable increase in charge speeds when we used it with Samsung smartphones. The iPhone 8, 8 plus and iPhone X all charged efficiently, but we found that they took about the same time as using a wired charger. If your main concern is preserving your charging port, this won’t pose much of a problem, but if you’re interested in faster charge times and you have an Apple phone, it truthfully might not be for you. 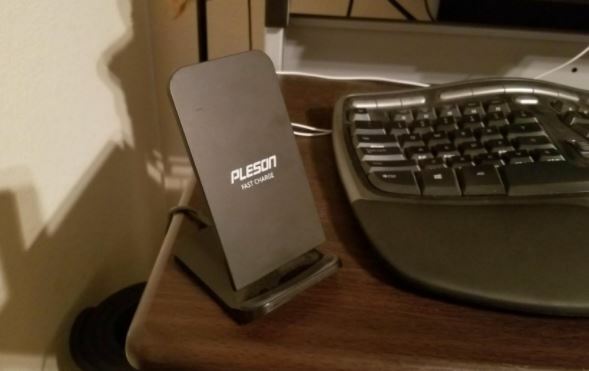 Overall, we really enjoyed the Pleson Fast Wireless Charger. It connected to smartphones easily and charged Samsung models at almost double the speed as the original charger. The design added an impressive level of versatility, mainly because it allowed for horizontal as well as vertical charging. For the professional who may rely on their smartphone during the day but also wants to keep it charged, we found this to be a great feature. There were a couple of downsides that made it a little less convenient, but it was nothing we couldn’t get past during our review. Magnetic interference issues as well as its inability to charge iPhones with the same speed as Samsung smartphones were the only two things about it that we felt might impact its usability. However, one thing it’ll do for just about any compatible device is preserve the charging port. Even with its few flaws, the wireless charging process with the Pleson Fast Wireless Charger is extremely efficient. It’ll easily help you get the most out of your smartphone by preventing long-term damage.